The St. Lawrence Supper Club will feature guest speaker Gordon Laxer, author “After the Sands. 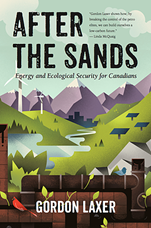 Energy & Ecological Security for Canadians” at the May 16 meeting. Gordon Laxer is the founding Director of Parkland Institute at the U. of Alberta, a non-corporate, research institute that does public policy research. Gordon is a Political Economist and professor emeritus at the U of A, and author or editor of six books, and has published over 40 articles and reports. “After the Sands” is shortlisted for the 2016 John W. Dafoe prize for non-fiction books. Meetings are held the 3rd Monday of the month at the Hot House Café located at the corner of Church and Front Streets. Socializing begins at 5:30, dinner at 6:00 p.m.
To reserve call: 416-361-0466 or e-mail: diane.gasner@utoronto.ca. For more information on the club visit: StLawrenceSupperClub.com.